I can hardly believe it, but summer is over. The kids are back in school and the fall winds are slowly making their way to Boulder. I can't wait to break out my sweaters and boots, cook my favorite stews and pick up a pumpkin spiced latte at Starbucks. This is my absolute favorite season for many reasons, one of which is it's family portrait time. 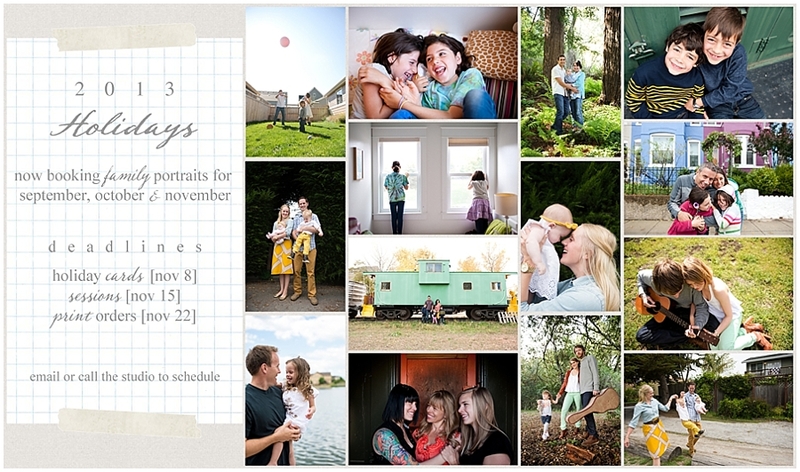 If you're looking to schedule your family portrait, please do so soon as my schedule is quickly filling up. To ensure that your portrait is completed with enough time for holiday cards and prints, I've set up a few deadlines. If you're like me, time flies by quickly, so hopefully this will help you plan ahead and have plenty of time for your holiday cards, photo gifts for grandparents and such, and a little time to relax.